Newer vehicles come equipped with range indicators to give you a general idea of how many miles you have until you are out of fuel. 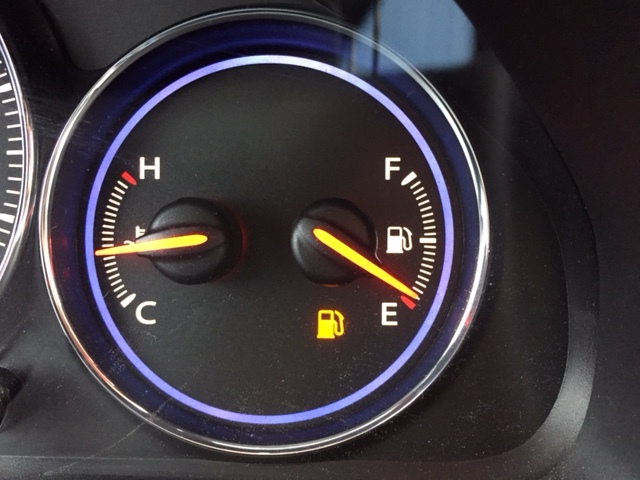 While this is a nice feature, do not let it make you lazy ……it is best to keep at least ¼ of a tank of fuel in your vehicle and keep the fuel light OFF. If you are going on a trip, fill up before you hit the road because you never know when you will or will not run across a station. And if you are driving a diesel vehicle, you may not want to hang out with the 18 wheelers at an interstate travel plaza in small town USA. It is best to be in control of your vehicle and the situation – monitor your fluids, check your tire pressure and keep your fuel tank filled. You can pay now or you can pay later. Very interesting & informative. I suppose my (silly) reasons for waiting until the light comes on are: 1 – wanting to see how many miles I can get on one tank of gas, and 2 – hoping the gas prices will go down by the time I need to fill up. Time to change my habits.